At my first Eve Fanfest back in 2013, CCP’s CEO Hilmar Péturrson talked about the bright future of virtual reality before revealing that a small team in the Iceland offices had been working on a prototype for something called EVR in their spare time. 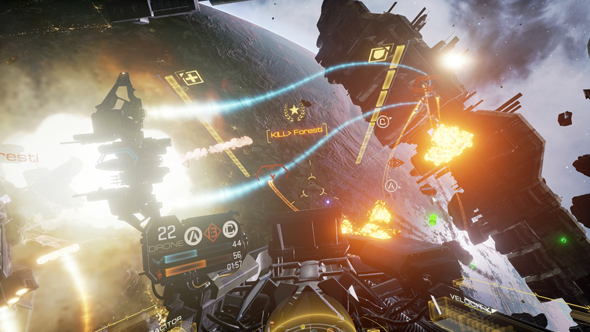 It was a VR space shooter that would later become Eve Valkyrie, a game that came bundled with the Oculus Rift. Over the next five years, CCP founded a VR-focused studio in Newcastle, refocused the Atlanta studio that had been making vampire MMO World of Darkness on VR games instead, and released multiple games for Oculus and the HTC Vive, as well as mobile VR games for cheaper headsets. They took on millions of dollars in investment to do all this. Then, in October last year, CCP closed its Atlanta offices, and sold the Newcastle studio to Sumo Digital. What went wrong and why have CCP struggled to find success outside of its MMO Eve Online? Everything you need to know about the next Eve Online expansion: Into the Abyss. If the games keep selling then that might change. Still, even a sudden turnaround would not get CCP back into the VR space. After looking through the trends they were seeing in the install base data and in the figures they pulled from their own games, the team concluded the market for VR isn’t there – and wouldn’t be any time soon – for the types of games they wanted to make. “Multiplayer games and services are quite expensive to make and the install base doesn’t justify that investment,” Péturrson says. “That’s why we decided to stop for now. While CCP are stepping away from VR, the company is still trying to make a shooter set in the universe of Eve Online – something it’s been trying to do for almost a decade. First with Dust 514, then Project Legion, and now Project Nova. But rather than move the Atlanta and Newcastle teams onto Nova, CCP have hired Sumo Digital to work on the forthcoming Eve spin-off. It could look bad from the outside, that two studios were shutdown and the project was instead outsourced, but Pétursson points out that the deal was set up before the studios were closed – “so we were up and running” – and CCP wanted Sumo’s “shooter expertise.” Sumo are currently working on Crackdown 3 and Dead Island 2, and are responsible for Hitman’s Colorado mission, too. Plus, in a roundabout way, the Newcastle team areworking on Nova, as Sumo bought the studio from CCP last October. The failure of CCP’s move into VR begs a question: Why can’t they find success like they did with Eve Online, their first videogame? “It’s just hard to make computer games,” Pétursson says. “In the beginning we thought it was easier because, I wouldn’t say we got lucky with Eve but it was a case of talent meets opportunity, but now that we have been branching into other games for quite a lot of time, I can attest, it’s quite hard. “It’s extraordinarily difficult to find a similar success to Eve – judging [our other games] by those standards may be a little unfair. It’s not like we’re the only company that cancels projects or misses their goals when it comes to releasing product, we see other companies also struggle with that. That pressure will remain until Pétursson can find a new pillar to support the business. He had hoped VR games would have been that pillar, or Legion before that, or Dust 514 even further back. Maybe Project Nova will be the game to shoulder CCP’s burden. If it isn’t then Pétursson will keep searching.